What makes a condo great, you might ask? Of course, there are some really amazing buildings out there (with really amazing price tags…). 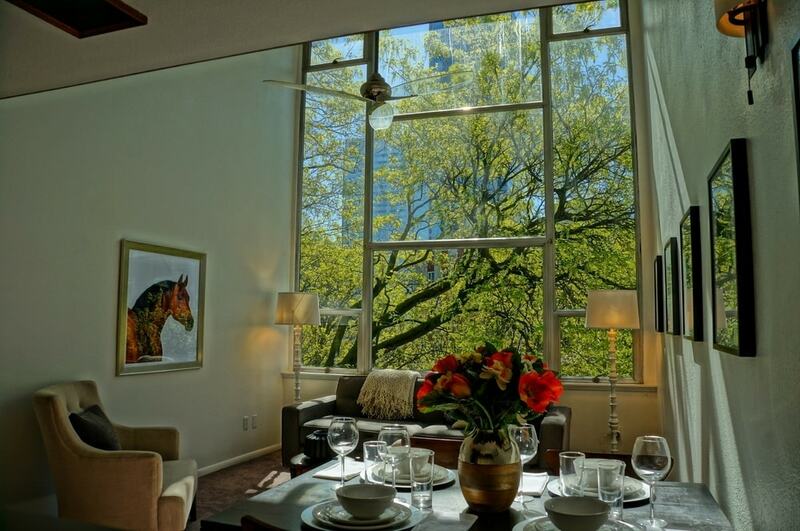 For the purpose of this blog and sharing our favorite condo buildings, we are also adding in value as a factor. (We’ll write a blog post about the most SPECTACULAR buildings another time.) Uniqueness, location, condition and value are all qualities that also add to future resale potential. So keep in mind, these condos offer a good value and are meant for the masses! 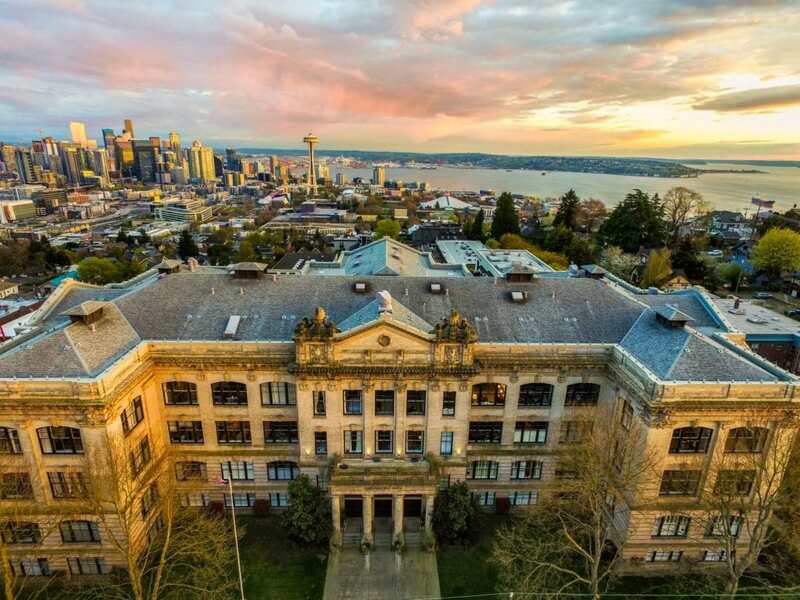 Read on to get an inside look at some of the most beautiful and unique buildings + excellent investments in Seattle! We can’t say enough good things about The Meridian, and it is truly our favorite building in the city. Originally constructed in 2002, The Meridian is built on rollers for earthquake stability, which was a first for Seattle. Top-notch management: The HOA is sensational, and the 24-hour concierge is always helpful and friendly, whether you need food delivered or you’re locked out of your unit. 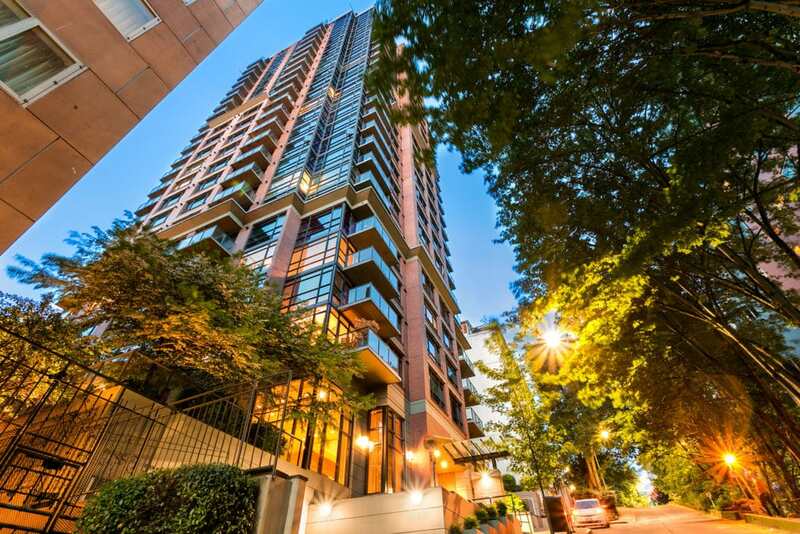 Amazing location: Nestled at the apex of First Hill, Capitol Hill, and Downtown Seattle, The Meridian is at the center of some of Seattle’s best offerings. Hit up shopping downtown and pick up a new outfit before heading out to dinner and catching a world class show at The Paramount Theater. Timeless style: The classic brick exterior shows off a blend of traditional and modern style, and you’ll feel proud to come home to this retreat every day. Some of the units in the building are starting to show their age on finishes, but the HOA is very friendly towards remodeling and we’ve had some great success with the remodeling process in the building. Click here to check out our latest 2-bedroom, 2-bath listing in The Meridian! 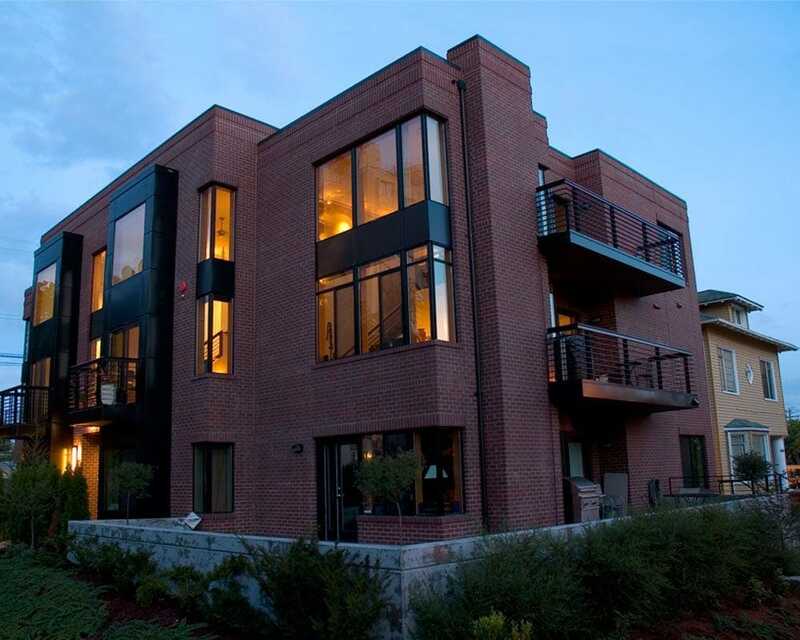 This boutique building has a custom, contemporary feel to it, and the original developer was a local guy that built it as a personal project; his daughter even lived in one of the units for years. Stunning design: This beauty shows off a timeless brick modern design, and it’s only a decade or so old. A few of the units even have fabulous lofted ceilings for that big feel that so many people love. Easy parking: Don’t worry about driving around the block searching for parking—each unit in this building comes with 2 parking spots, which is pretty rare! 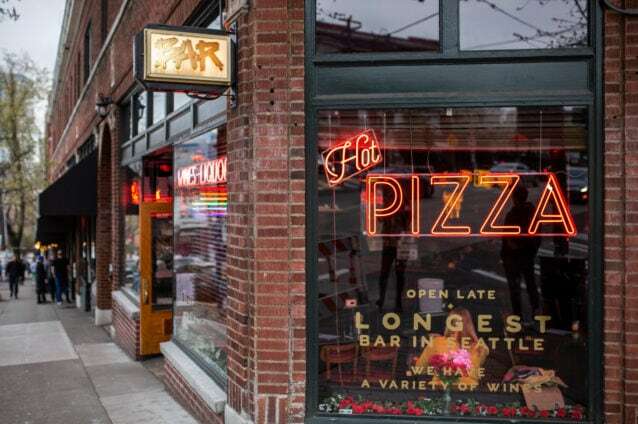 Prime Capitol Hill location: Take advantage of The Opal’s perfect Capitol Hill location while being a bit tucked away from the madness. This building is absolutely *STUNNING* and we love it! 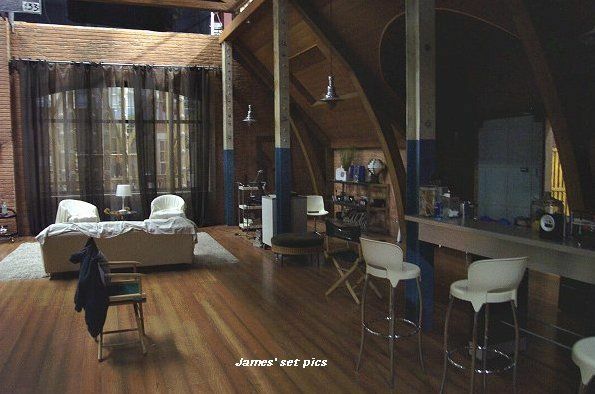 Converted from an old warehouse (textiles or something like that way back in the day), these condos totally remind us of Brian and Justin’s loft in Queer as Folk! Incredible one-of-a-kind style: Characterized by exposed brick and big wood beams that dramatically stretch across the ceilings, this architecturally significant building is such a unique opportunity. You can make your unit exactly what you want it to be—none of the walls are supporting, so you can gut it and put things wherever you want them. Premium location: Pioneer Square has been cleaning up so fast, and all of the shops and restaurants opening up here have been ridiculously good. Plus the viaduct is getting torn down. These units are just going to keep getting more expensive as the area transforms. One of the downsides of the building is that the dues are astronomical—in fact, they are $2,764 per month. (Yes, you read that right.) 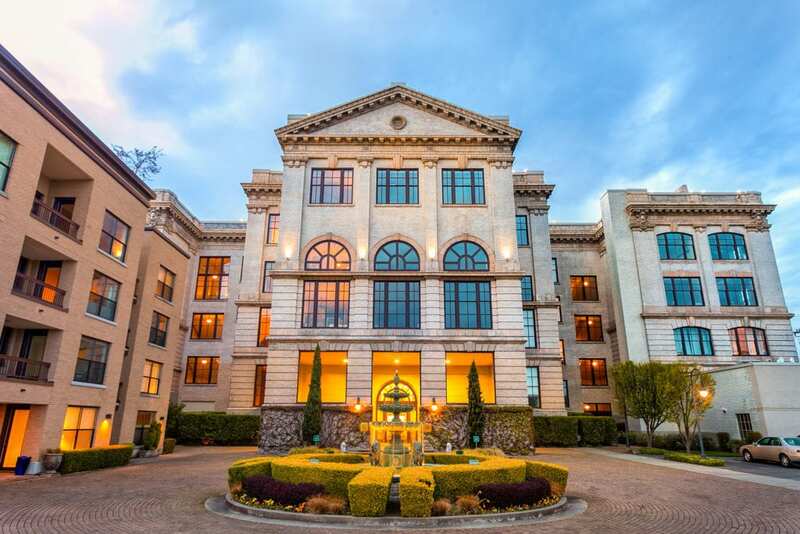 In May 2018, a 1,852-square-foot unit sold for $850,000. It’s all relative. You just have to be okay with the fact that your place will always sell relative to others like it. Spectacular showstopping views: Huge balconies wrap around entire units, and they’re like 8 feet deep and 30 feet wide! Especially if you’re above the 6th floor or so, you’re looking at some of the BEST views in all of Seattle. You can see south through SODO, all the way north through Fremont, plus views of the lake, the sound, the Olympics… all with the entire city on display. At night it just gets better—the whole city lights up and it’s just dreamy. 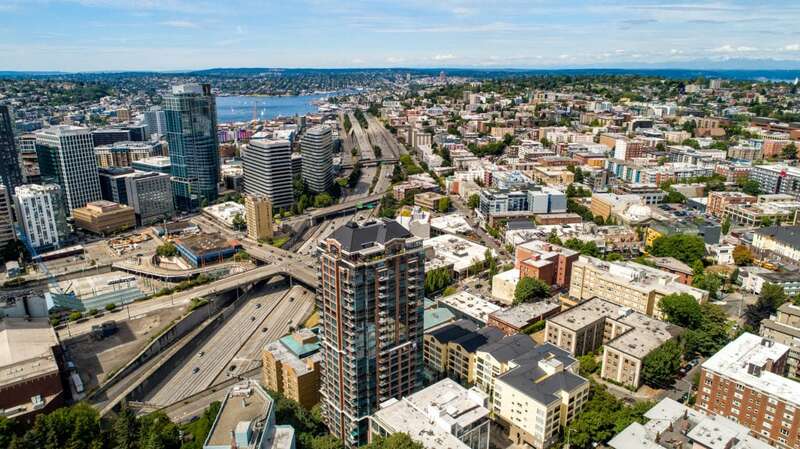 This also means you’re in a prime location—take advantage of Capitol Hill’s amenities while being just up the hill from South Lake Union. Fascinating architecture: They just DO NOT construct gothic buildings like this anymore. To make something like this today with all of that marble and concrete would be prohibitively expensive. The walls are as thick as a Volkswagon, and as a result, it’s peaceful and silent inside. The stairwells are wide enough to fit two lanes of traffic in them, and there are also these huge palladium windows,. 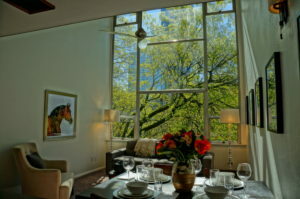 Plus, enjoy stunning views of Downtown Seattle, the sound, Queen Anne, Fremont, and beyond. Highly desirable location: With an 88 walkscore you can take advantage of the quiet and residential neighborhood feel while still being close to Downtown Seattle and surrounded by convenience. The downside is that now the units are about 12 years old and starting to feel the need for remodels. But the deals you can get in the building are great for the price vs. size. And keep in mind that while you can recreate these units… you can never recreate the building. If you want to see more photos and get an in-depth look at the neighborhood, click here to see one of our previous listings that has all of the details! 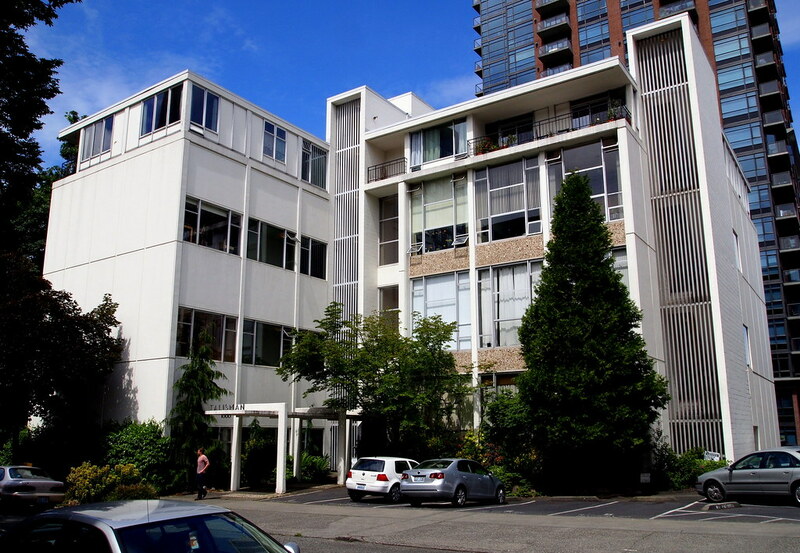 Perfect Airbnb investment opportunity: This is one of the few buildings in Seattle that allows Airbnb unfettered. It’s perfect location makes it an attractive option for people who want to rent an Airbnb, meaning you can charge a pretty penny. The last Airbnb in the building that we took a look at was a 2-bedroom, 2-bath unit for $450,000 that made $88,000 from Airbnb in 2017. And this only sweetens the deal: For $30 the concierge will check in people and take them up to their room. !!! 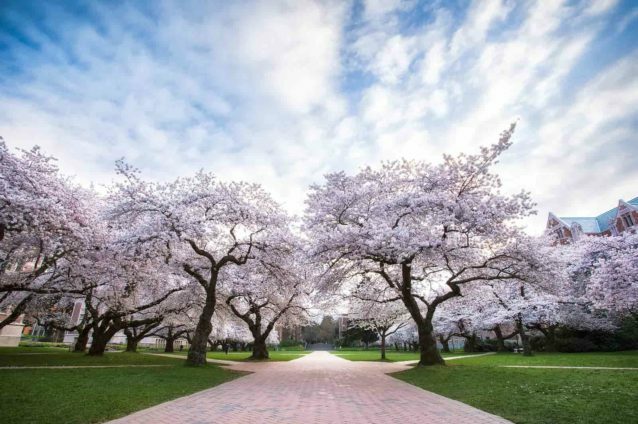 Excellent location: As we just mentioned, the Airbnb potential is out of this world thanks to the central location right off of Downtown and Capitol Hill. The Convention Center is right there, the Paramount is close by, and anything else out-of-towners would want to explore is at their fingertips. 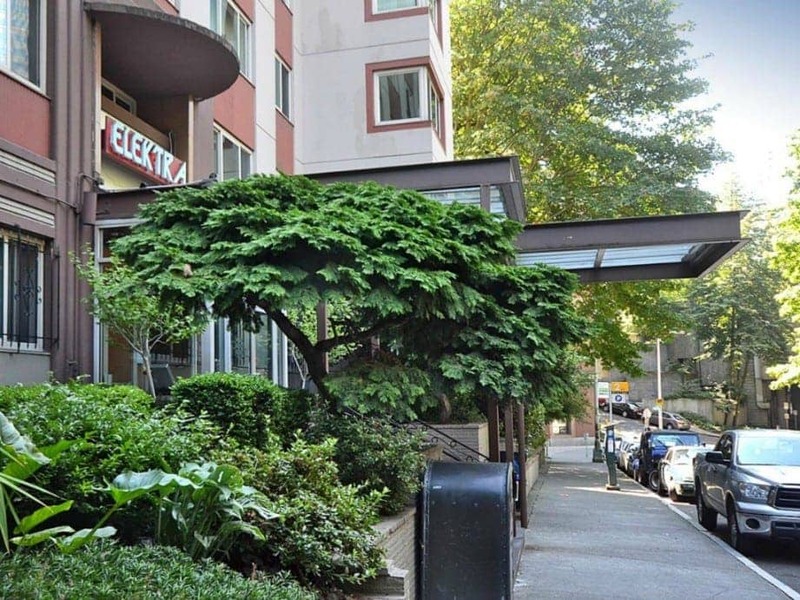 Awesome HOA: We love a well-managed building, and the Elektra is the best! Plus, HOA dues include *everything*—heat, cable, water, sewer, garbage, building maintenance, and secured entrance. The Talisman is mid-century modern design in a nutshell. This solid beauty has really stood the test of time. In fact, it’s gorgeous design has garnered it a bit of a following, and if you ever get to see inside, it will be obvious why. Great management: You don’t have to worry about this building’s HOA! It’s very well run, which we’re always pleased to discover in a building. Impeccable design: It has a very “Jetson/space age” feel to it, and it’s a delight to remodel these units—you can totally embrace mid-century modern and just have fun with it. 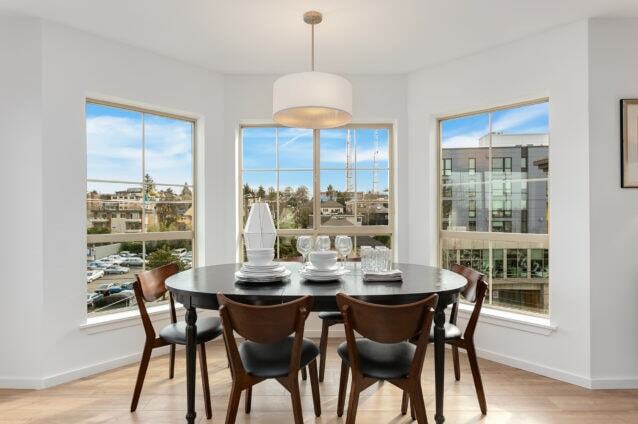 The lofts aren’t huge, but they feel big with 16-foot windows. Plus, the sturdy concrete floors mean that you can’t really hear your neighbors. On the downside, the building is older, which means the walls aren’t as thick as newer buildings. Parking is tight, and there’s not much in terms of views. Also, many units don’t have a washer/dryer, but you can put them in if you want. Also, they conveniently have washer/dryers available on every floor for easy access. 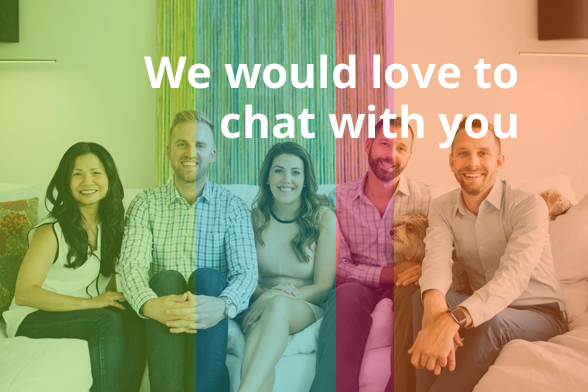 Have a question about condo living in Seattle?